Learning doesn’t happen without relationships. In the classroom, rules matter, but as many of us have learned after a few years teaching, relationships matter much more. One way we can deepen our relationships with students is to share a bit about ourselves with them, and create opportunities for them to share with us—and each other. Of course rules, routines, and policies are crucial to outline for your students on day one so they know what to expect. We learn early on in our careers as teachers that being firm and clear about classroom expectations from the start will make all the difference for the kind of year we will have. What struggles did you have growing up? As a student? What would you change about the world if you were able? If you knew it would work out, what are some risks you would take in life? How about sharing some artifacts? A few of your all-time favorite books? What was your favorite at 12 years old? At 16? At 20? Bring copies of those books to show your students. Bringing in photos from your life is always a hit as well. Why share yourself in this way? Showing our humanity to students allows us to be people and not just The Teacher. And in my observations and experience, to be loved by those whom you teach, you have to show vulnerability, at times reveal who you are, your feelings, challenges, hopes, cares, and dreams. We ask students to write essays and poems and speeches in which they share vulnerable aspects of themselves. As teachers, as members of a classroom community, shouldn’t we do the same? Once you’ve presented aspects of who you are, invite students to do the same. You’ve set the stage, showing some vulnerability and openness with them, so they see that this matters to you and that as a group you’re a class not simply of teacher and students, but of people. Good Things: Ask students to pair and share a good thing that happened for them or something that they’re looking forward to. It doesn’t have to be anything major—it can be something as simple as, “It’s taco night at my house tonight.” Perhaps someone’s sister just got married or someone’s birthday is in a week. 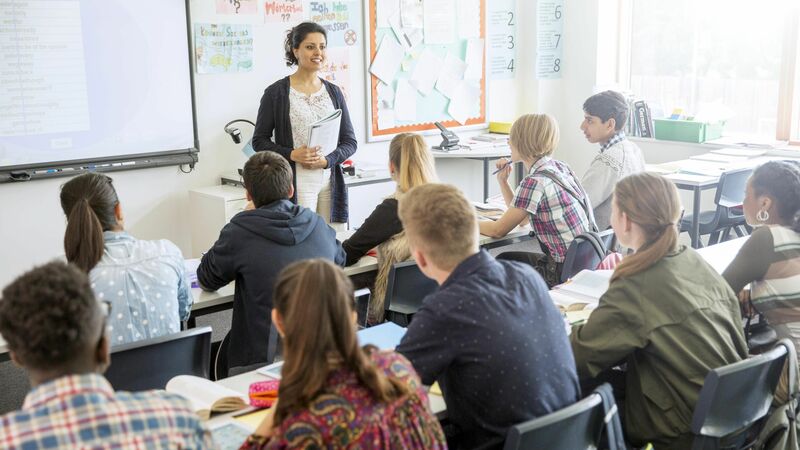 Start each day or class period with Good Things, and as students get more comfortable with it, expand the groups to four or five students to help forge more community connections. You share too. Create an “All About Me” Bag: Provide each student with a paper lunch bag. Ask them to decorate the outside with words or images of things they like or what others can easily see about them. Have them place several objects in the bag that represent or symbolize things not easily known about them (e.g., a pet toy that belongs to their cat, a photo of them playing soccer, etc.). If you make one yourself, you can share it in your introduction—it can serve as a model. Give class time for them to share with a partner and in small groups. Artifact Sharing: Just as you might bring in some of your favorite childhood and teen books, invite students to bring in artifacts from their lives—photos, books, and awards—and share one-on-one, in small groups, or with the whole group. Student Information Survey: Create a survey with age-appropriate and subject-appropriate questions. Have students complete it. Share with them that this is for you, the teacher, to get to know them. Before collecting it, however, ask students to choose two or three responses they’d like to share with others. Provide time for them to pair up or get in groups of three and share, for example, their favorite music, food, and subject in school. Meaningful relationships matter for learning. The rules and policies you enforce are important for keeping a well-managed class. But rather than emphasizing control over your students, developing community and connection is a surefire ingredient for a good school year for all.